We would like to always look for the good in people but in reality many people are “not so good.” Many times our furry friends who give us unconditional love all the time are used and abused. This is one thing that I won’t tolerate and one thing that I despise! Some people take their miserable lives out on pets that they should never be allowed to own. So what can we do? 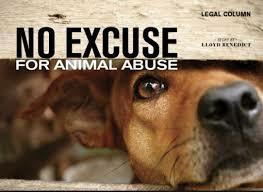 I urge you to report animal cruelty even if you suspect that a pet is being abused. The ASPCA has published a complete guide to recognizing and reporting animal abuse. Please take a look at the article below, keep it handy do everything you can to report animal cruelty. Photographs of the location, the animals in question and the surrounding area. Note: do not put yourself in danger! Do not enter another person’s property without permission, and exercise great caution around unfamiliar animals who may be frightened or in pain. It is possible to file an anonymous report, but please consider providing your information. The case is more likely to be pursued when there are credible witnesses willing to stand behind the report and, if necessary, testify in court. Keep a record of exactly whom you contacted, the date of the contacts, copies of any documents you provided to law enforcement or animal control and the content and outcome of your discussion. If you do not receive a response from the officer assigned to your case within a reasonable length of time, make a polite follow-up call to inquire about the progress of the investigation. While an aggressive, timid or fearful animal may appear to be a cruelty victim, it is not possible to know if an animal is being abused based on their behavior alone. It is best to examine the animal and his surrounding environment to determine whether or not he or she needs help. Access this background information for a particular website by visiting www.whois.net and doing a “whois” search of the site in question. Contact the site’s ISP (Internet service provider) about the offensive material. The ASPCA shares your concern about the media’s depiction of violence and cruelty toward animals for entertainment purposes. Please know, however, that many of these instances are constitutionally protected free speech—and may not even involve a real animal. If you are offended by something you viewed, contact the network that aired the program or the publisher of the film in question. You may also wish to contact the American Humane Association Movie and Television Unit online or at (818) 501-0123. For concerns about animal cruelty in pet stores, please contact the U.S. Department of Agriculture (USDA) at (301) 851-3751, www.aphis.usda.gov, or ace@aphis.usda.gov. The USDA will direct you to the appropriate regional department to which you will be asked to submit your complaint in writing. Thanks to the ASPCA for providing the very valuable information! Edgewater Gold Radio plays the best oldies of all time. Keep us on all the time. Download the free Edgewater Gold Radio app or listen from our website: Edgewatergoldradio.com. This entry was posted on Friday, January 25th, 2019 at 9:48 am	and is filed under Pet Supplies. You can follow any responses to this entry through the RSS 2.0 feed. Both comments and pings are currently closed.